When I joined my company three years ago, we had around 35 LA-based employees and no dog policy — anyone could bring in any dog at any time, there were no punishments for barking or pooping inside, and dogs could be on any piece of furniture anytime. This was fine as a startup. But as a company, we grew from pupper to doggo, our lenient approach to dogs soon became a recipe for disaster and our office was effectively one giant dog park. And, let me tell you, this was stressful. Why? After all, there’s research coming out about the benefits of dog-friendly offices, that owners and non-owners alike are less stressed at work. And many employees deliberately seek out dog-friendly workspaces in the job search, so if you’re in a highly competitive industry like tech or media, letting employees bring dogs to work can help ensure you have access to the best talent. Our problem wasn’t that we had a dog-friendly office, it’s that we didn’t have a policy to regulate it from the start. How many dogs should we allow? This was our most challenging problem in building our policy. By allowing all dogs to come into the office without a schedule, we found we were in violation of our lease — which permitted three pets per day. The lease was perfectly clear, but because we had created a somewhat permissive culture surrounding the dogs, the fact that we had to limit the number of dogs allowed in the office was taken very hard by the dog-parents among our staff. After all, a selling point of our company was that employees had the opportunity to save on doggie day care. My hands were tied; I couldn’t change the lease, but you’d think I was actually Cruella de Vil from the reaction this brought to my desk. Lesson learned: Check the lease for a clause as to how many dogs you’re allowed, and if there isn’t a numbers-restriction written into the lease, create one from the start. You’ll want to consider your physical space for this as well — tight quarters and lots of paws don’t always mesh. What happens when we have more dogs than are allowed by our policy? We solved this problem with a Google calendar sign up. At the end of the month, all dog owners are given the choice of days for the following month. They are then free to trade or give away days as they see fit, all so long as we have no more than three dogs at any given time. What’s our policy on puppies? While there’s just about nothing cuter than a puppy, you should consider age restrictions on your office dogs. Puppies chew on things, aren’t potty-trained, need disciplining…all traits that are not exactly conducive to an office environment. Our policy states that dogs need to be at least six months old before they can be daily desk-mates. How will we deal with behavioral issues? After lots of barking on conference calls and doggie doodoo inside the office, we created a point system. Each time a dog is a bad dog, or an owner is a bad owner, anyone in the office can file a complaint and the dog in question is given a point. Five points and you’re out for a month. Different violations have different point values and different punishments — peeing or pooping in the office is an immediate 30-day ban, but if a dog is found on furniture, it’s just one point. Can dogs go everywhere in the office? Are there some rooms or meetings where dogs aren’t allowed? Currently, we have only one room where no dogs are allowed. It might be worth considering not having dogs in carpeted rooms to protect against allergens, or placing a ban on dogs inside important meetings. What happens if we hire someone who doesn’t like dogs? Though it may be tough for you to process, some people just aren’t dog people. And, of course, it’s extremely illegal to not hire someone because he or she doesn’t like dogs, so take into account that you will, sooner or later, deal with this — whether it’s due to allergies, fear, or just plain not being a dog person. It’s important to make accommodations for these employees, lest you come across, as an employer, that you prefer dogs to people. 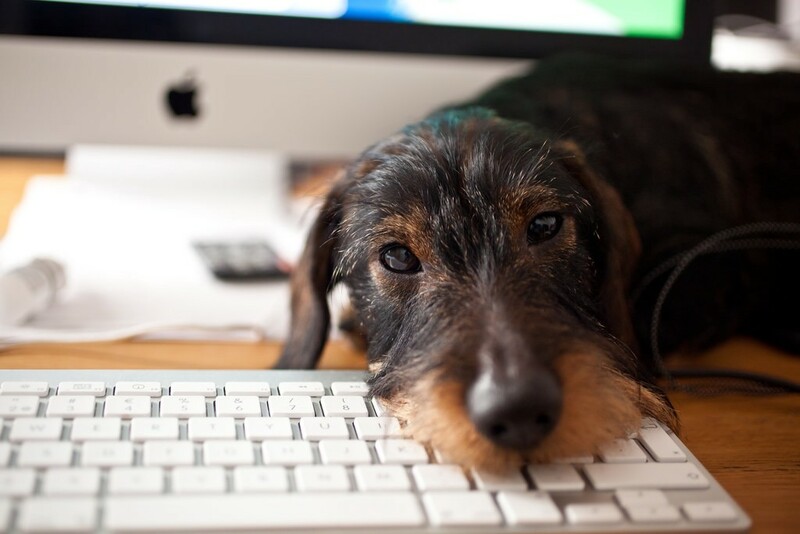 What makes a dog an office dog? Not every dog is going to be cut out for hanging out calmly all day, and that has to be okay. Decide where the boundaries lie for what’s considered permanently inappropriate for your dog-friendly office. Warning: this might be the hardest question of all to ask. It’s not singling out if a dog consistently proves itself unworthy of office time, but the conversation between business authority and dog owner will be difficult if a dog receives a permanent ban. Finally, make sure that your office differentiates between pets and service animals. Service animals, according to the Americans with Disabilities Act, are allowed to go wherever their owner is allowed (unless of course, you work in someplace like hospital operating room and the dog’s presence might compromise the sterility of the environment). Also, don’t be that person who gets their dog certified so you’re allowed to bring it in every day when you don’t actually have a medical reasoning. It de-legitimizes the notion of an actual service animal. I recommend having a group of people, both dog owners and not, get together and iron out the policy very early on to avoid potential (read: certain) conflict. Make sure that policy has some grit to it, too — without teeth, you’ll find yourself in the position I was in, the days turning into dog years on my patience.